There is controversy surrounding whether carbohydrates are good or bad. The low-carb movement (the Atkins onslaught) of the late 1990s and 2000s did much to focus attention on the role of carbohydrates in obesity. Are carbohydrates good or bad? Opinions are all over the place. Many low carb advocates suggest to avoid all carbohydrates altogether. What, even vegetables and fruits? Yes, even vegetables and fruits. As always, the answer to this question is far more nuanced. High insulin levels drives weight gain and obesity. Since refined carbohydrates tend to cause the highest increase in insulin, they play a key role in weight gain. 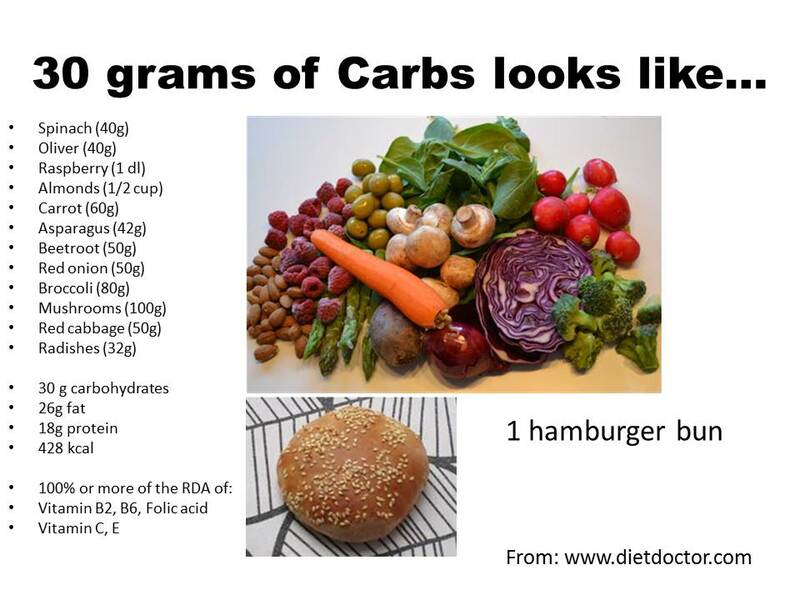 That certainly does not mean that all carbohydrates are bad, however. It has been recognized for some time that there is a big difference between ‘good’ carbohydrates (whole fruits and vegetables)and ‘bad’ carbohydrates (sugar and flour). Even common sense would tell you that eating a lot of kale and broccoli will not make you fat no matter how much you eat. Eating lots of sugar, though can certainly cause weight gain. Yet both are carbohydrates – so what is the difference? We need a rational way to distinguish between type of carbohydrates. Carbohydrates are chains of sugars linked together. The original classification of carbohydrates was into simple and complex carbohydrates. Simple carbohydrates consisted of 1-2 sugars linked together. This included glucose (1 sugar) and sucrose (2 sugars – glucose and fructose). Complex carbohydrates were longer chains of sugars – such as white flour. The problem with this classification is that it only takes the length of sugar into account. It does not differentiate the carbohydrates based on its physiologic properties (effect on the body). White flour, for instance was a complex carbohydrate, but it raised the glucose as much as glucose. Dr. David Jenkins of the University of Toronto began to tackle this problem in 1981 in one of the first publications on glycemic index (GI). He recognized that there was no physiologic basis for the carbohydrate selection for diabetics at that time. By measuring the glucose raising effect of each carbohydrate, he could assemble a list of food and rank them according to their propensity to raise glucose. 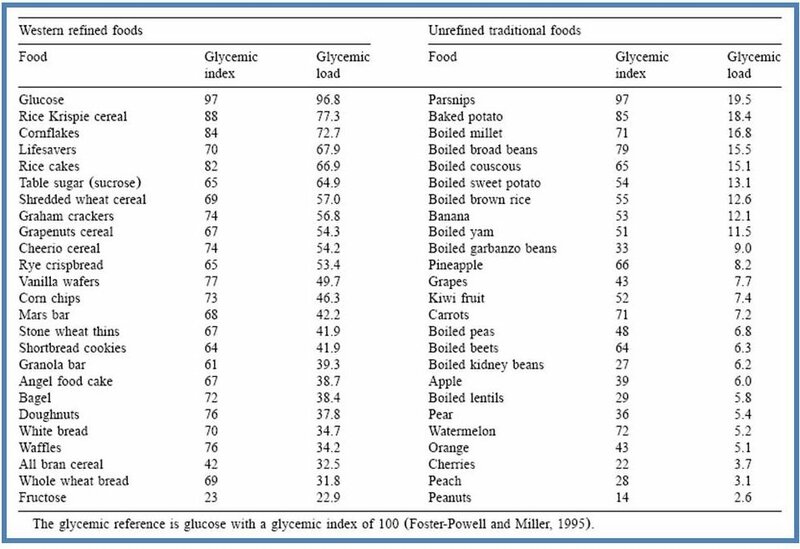 This is the glycemic index. This is a huge step forward, because now we can classify carbohydrates according to their physiologic effect rather than on chain size. The GI uses identical 50 gram portions of carbohydrate to measure the effect on glucose. Glucose is set as the standard against which all other foods are measured and therefore assigned a value of 100. One of the problems with this measurement is that 1 serving of food may not have 50 grams of carbohydrate. This leads to various distortions. For example, watermelon has a very high glycemic index of 72. However, most of the weight of the watermelon is water and only 5% of that is carbohydrate. So you would need to eat 1 kilogram (2.2 lbs!) of watermelon to get 50 g of carbohydrate. A corn tortilla has a similarly high GI of 52, but the % carbohydrate is 48%, so you would only have to eat 100g of corn to get 50g of carbohydrate. The Glycemic Load (GL) is an attempt to correct this distortion by adjusting for the % carbohydrate in each serving size. By doing this correction, we get a more clear idea of the glycemic effect per serving size, rather than per 50g portion of carbohydrate. Watermelon turns out to have a low GL of 4, but the corn tortilla still has a high GL of 25. Foods are composed of 3 macronutrients – fat, protein and carbohydrate. As carbohydrates (chains of sugars) are broken down in the body to be absorbed, they raise the blood sugar. Protein and fat have a much lower effect on blood sugars. 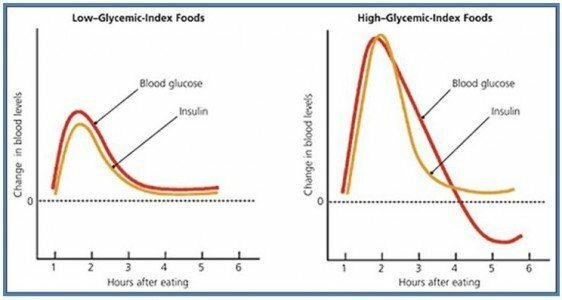 This is why the glycemic index measures the glucose-raising effect of carbohydrates without much concern for the fat or protein content. The insulin levels tends to correlate with glucose levels. As the glucose level goes up, the insulin level also goes up. However, what is not commonly appreciated is that insulin level can go up without the blood sugar going up. You can measure an insulin index of foods by checking how high insulin levels go after certain foods. While the refined carbohydrates spike the insulin the highest, it may surprise some that dietary protein also tends to increase insulin levels. One of the other major problems of the GI is that it only considers the effect of each food taken in isolation. Co-ingestion of foods that include fibre, fat and vinegar has a large effect on the resulting increase in blood glucose. The GI and GL do not take this into consideration at all. There are many diets based on eating foods that are low on the GI, GL or both. They have had mixed success rates. Even though it may seem at first that this is a large scientific advance in classification of foods into ‘good’ and ‘bad’, the benefits have been very difficult to find. There is a huge, huge problem with the use of GI diets for weight loss. Blood glucose does not drive weight gain. Hormones – particularly insulin and cortisol – drive weight gain. Insulin is the major driver of obesity. Therefore diets should be targeted at lowering insulin levels – NOT blood glucose levels. While people assumed this was the same thing, it turns out that the insulin index of foods is quite different from the GI. Insulin secretion also depends significantly upon insulin resistance and the foods taken in conjunction with the carbohydrate. Focusing narrowly upon the blood glucose, while it may have a role in diabetes, does not help us with an obesity strategy. Furthermore, the GI does not consider protein or fats at all because it measures only the effect of carbohydrate containing foods. The GI/ GL strategy assigns 2 of the 3 major macronutrients have essentially zero role in weight loss and gain. A comprehensive theory of obesity would not be so cavalier in discarding this valuable information. Since protein also tends to increase insulin, eating a high protein diet may also lead to weight gain. The GI does have its uses, though. Looking at carbohydrates through the filter of the GI, a significant amount of research has been done and is quite useful. There is a clear distinction in GL between Western refined foods and unrefined traditional foods. Western refined, processed food have a very high GI and GL, whereas whole foods tend to have a very low GL. What is it about processing that tends to raise GL? It is the removal of fat and fibre that drives the GI way way up. Carbohydrates are not inherently bad. The toxicity lies in the processing. People have been eating carbohydrates for thousands of years – potatoes, sweet potato, beans, fruit etc. What has changed recently, is that we now predominantly eat refined grains as our carbohydrate of choice. There are two main reasons why refined carbohydrates may be dangerous. The first is that it increases the speed of digestion. The main benefit of the GI is to highlight this important issue. Increased speed of digestion causes the glucose to spike up and the insulin levels to spike up. The second major reason that refining is dangerous is that it may encourage overconsumption. Think about the 5 oranges that it takes to make a glass of orange juice. It is very easy to drink a glass of orange juice, but to eat 5 oranges is not so easy. By removing everything other than the carbohydrate, we tend to over consume. If we had to eat all the fibre and bulk associated with 5 oranges, we may think twice about it. As far as I know there is no nutritional requirement for folic acid. Folic acid is an artificial chemical which is mildly toxic and if your body cannot transmute it to a useful form of folate can build up. A corn tortilla is almost all carbohydrates, not 48%! What are you smoking?